Traveling with children opens up a whole new dimension to your travel experience, and to the children's perspectives. Planning a trip with children, specially to international destinations, is important so everyone can make the most out of it. We spoke to Linda Cohen, the President of GlobalVision Travel Resources, Inc. whose mission is to promote cross-cultural understanding by encouraging and supporting international travel among families. Linda loves to travel, and together with her husband and two children, are continuously exploring the world. We asked Linda a few questions about her own travel philosophies, about planning her trips, particularly her trip to China. Enjoy her answers! Linda, in your opinion and based on your own travel experiences with your children, what are the advantages of exposing kids from an early age to different countries and cultures? Travel at any age gives children the opportunity to appreciate that there are many different good ways to live. That their suburban American life is not the only great way to live! It expands their thinking about people and life. Travel brings history to life and enriches learning. Our kids get such a thrill out of seeing historical places that they have studied about in school. Or, the opposite happens-- sometimes they've already visited a place when they start to study its history. I think this really enhances the learning experience. International travel requires a great deal of creativity, flexibility and a sense of adventure. Things don't always go right, or the "plan" isn't always the best way to go. Our kids see us change and adapt our plans to take advantage of all the adventures that pop up along the way. While we teach our children to be cautious in terms of their safety, we also show them that it can be fun and enriching to try new, unexpected experiences. One of my daughter's favorite traveling days took place in the Galapagos Islands. We had had the same tour guide the entire week and grew to trust her. The last day we were there, she offered to take Emily to a friend's house who had a girl the same age. The two little girls spent the day together making cookies! That would never have been something I would have anticipated or planned, but it was a fun day and a great way for my daughter to get to know one of the local kids. It's good for kids to see they can be flexible and adventuresome. The opportunity to see countries with their traditional values and culture is rapidly diminishing. I feel a great sense of urgency for our kids to learn and see new cultures before there is a Starbucks at every corner. With the internet, there is much homogenization of cultures. In fact, that's how our journey with our kids began. On a trip to London about 7 years ago, I was astonished to see how much it had changed in the 15 years since I had been a student there. When I was a student there, things were really different in London versus how they were in Chicago (where I grew up). People dressed differently, their music was different and the buildings were mostly historic. On my return trip 15 years later, I felt as though I could have been walking in nearly any large American city based on the clothes, music, restaurants and proliferation of new, modern buildings. It made me want to hurry up and show our kids places while they retain some of their cultural heritage. Frankly the opportunity to travel on nice, long vacations rapidly diminishes as kids get older. Once they start playing on sports teams and making commitments to school organizations, their free time (and ours) becomes scarce. Not to mention the fact that at some age, it becomes a lot more interesting to spend time with friends rather than family, including on trips. So, we treasure the younger years as a great time for family travel. It is true that some memories fade when you travel with young children. For that reason, I always make a really detailed scrapbook of each trip right when we get back. We keep them out on our familyroom table and are amazed at how frequently our children and their friends will flip through the books. How old were your kids when you went to China? My son was 13 and daughter was 10. How did you plan your trip? Did you join a group or did all arrangements on your own? What are the advantages of doing it this way? I'm a BIG believer in doing it on my own. I estimate that I can build an itinerary and experience for about half the cost (if not less) of going through a planned tour. Also, it's easy. All you need is access to the internet to plan a spectacular trip. That being said, despite the fact that I really favor making arrangements on my own for our family travel, I actually did use a travel agent to book our flights to China. It turns out for Air China, at least as of July 2007, it was less expensive to go through an agent than to book directly through the airlines, so it is always worth it to check. When I plan any trip, including our trip to China, I typically spend some time upfront looking at what the really top tour companies offer. Then I usually buy one of the DK Eyewitness Travel Guides (my favorite guidebook) and look further into the possible destinations. Once I know where I want to go, I make sure I can use any free airline miles(!) and select hotels based on recommendations from CondeNaste (concierge.com) and Tripadvisor.com. Almost all of this can be booked over the internet. To get local guides (which I think are critical to enjoying and getting the most out of a trip), I ask friends who have traveled to the country and also ask the concierge at the hotel to make connections. We always arrange private tours. Believe it or not, they are usually LESS expensive than the group tours the companies offer and we can design our day exactly as we wish and keep it short (the only way to go with kids). We usually email back and forth with the guide in advance to roughly map out our plans, but always look forward to the surprises that pop up along the way. We always ask to meet local people when possible and to see local, regular spots. Our favorite is to go to the grocery store. It?s always interesting to see what foods are popular. In France, we were amazed at row after row of yogurt! In China the grocery store was full of unimaginable delicacies. Often it's the local guide that we remember most, his/her story about her family and her life. We place a lot of emphasis on finding really terrific guides for this reason. I usually try to find people that have some teaching experience or other relevant experience with kids. In China, my kids were amazed to find out that our guide could only (in theory) tell us what the government wanted him to say. This exposure to communism was really eye-opening. My last step in trip planning is always to get the kids excited and immersed in what we are about to do. Typically, I have to find bits and pieces that the kids can grasp from adult-oriented guidebooks. 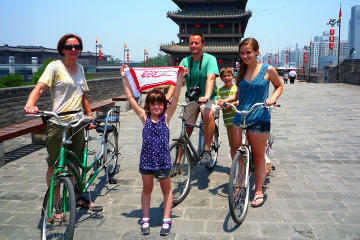 What were some of the most memorable moments and places the kids really enjoyed during your trip to China? Our trip to China was full of remarkable memories. I think we laughed , smiled and ate the most while learning how to make dumplings in a cooking class at our hotel! In terms of historic spots, the kids absolutely loved the Terracotta Soldiers -- getting up so close to something they had read about. We were also very pleasantly surprised by a fun afternoon in Shanghai at the Municipal Planning Building. Sounds boring?! Our guide suggested it at the last minute and we decided to try it. It was fabulous! A little model of the entire city of Shanghai spread out across a large room. What is next for the Cohen family? Your next trips in the horizon? Next summer we are going to Africa. We will visit South Africa (Cape Town and Kruger National Park), Zambia (Victoria Falls) and Botswana (Chobe National Park). I'm currently in the planning stages of this trip now and we're all really excited, especially with all the animal lovers in the family. The next big trip will be Antarctica. I've set a goal to try to show the kids each continent before they are off to college. They've been to the other six already, so Antarctica will be next. They think I'm kidding, but I'm not! Linda, thank you so much for taking the time to answer our questions. We wish you much success in your endeavors, and we look forward to seeing that picture with all four Cohens in Antartica before Starbucks gets there! If you have any comments or tips you would like to share... here's your chance!